This post gets pinned, re-pinned, posted and linked more than any other project I have done. In fact, I recently sold the photo of my original paper bag advent calendar to an Austrian Magazine. So, I thought why not re-make it with a little tweaking and updating. I think my favorite thing about this project was the surprise that I discovered as the first few days went by and cards started filling the mailbox. The empty spots from the bags holding little presents became the perfect spot to display all of the beautiful Christmas cards with photos. My favorites always seem to be the tinyprint Christmas cards. I used a 4′ x 4′ plywood board from Home Depot and painted it with chalkboard paint. I attached three pieces of sisal rope (also from Home Depot) using a glue gun. This time I used my Sharpie water based paint pen instead of actual chalk. I used white standard size lunch bags. 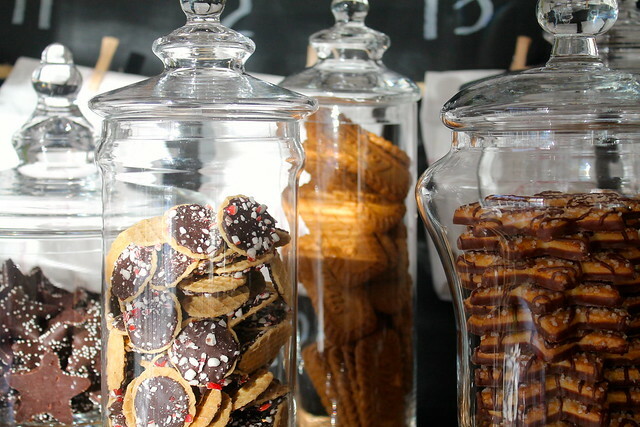 I filled my glass jars that I bought at Rogers Garden a million years ago, but they pretty much have the same ones at places like Michaels with sweets from Trader Joe’s. I wrapped black and white buffalo checked fabric squares around my tiny trees from the grocery store. The great thing about this huge chalkboard is that I can use it for other things….like a quote for Thanksgiving, maybe. I didn’t think you could top the advent calendar from 2011, but this is pretty amazing, Annie! 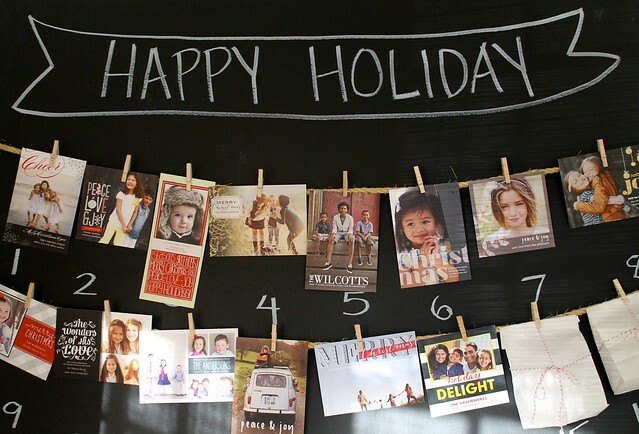 Love how you swapped out the bags for holiday cards-so beautiful! 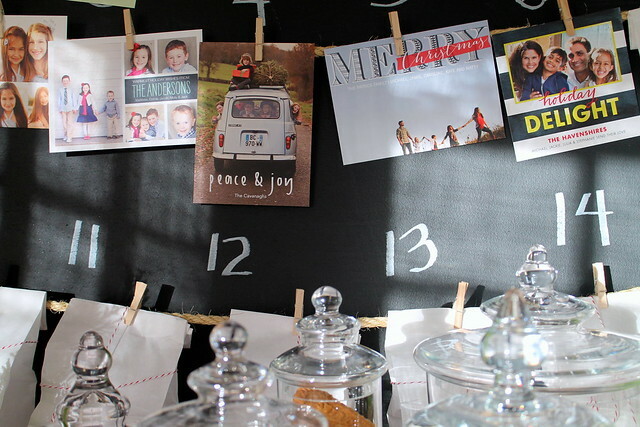 What a great way to incorporate holiday cards into the advent! I never know a good way to display cards, but this is such a smart idea. this is so gorgeous annie! I just love this, Annie!! 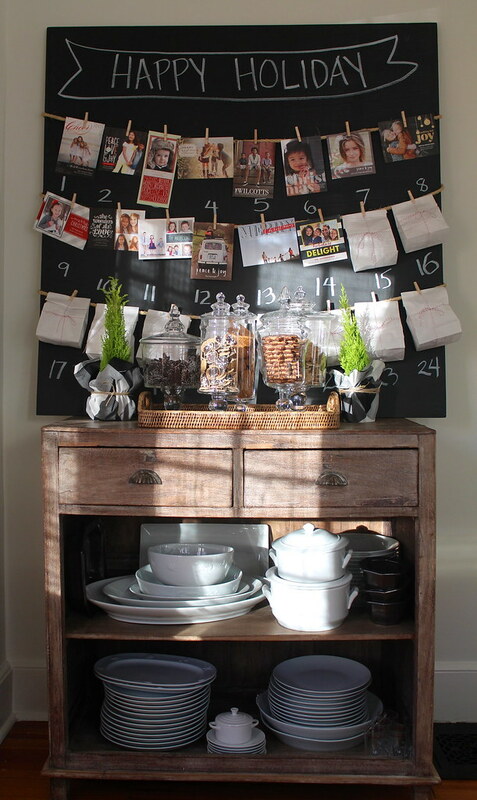 I love the idea of filling the empty spaces with cards. How clever! Gorgeous! and love the idea of filling the spaces with cards! 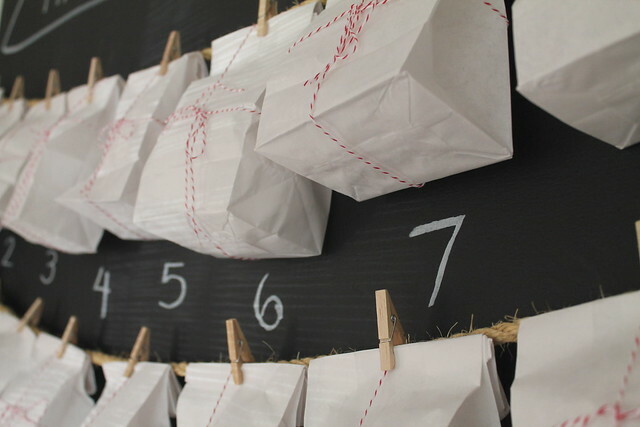 Each time I see your Paper Bag Advent Calendar I love it more… it’s my favorite! It say’s; Warm loving home, family, faith and creative Mom!! Just adorable. In Australia people do not really send out christmas cards or holiday cards, maybe this is something we need to start! I did not realize that in Australia it was not a tradition to send out holiday cards. It seems now that photo cards have almost replaced the traditional Christmas greeting card… which of course we love! Love this! How did you apply the sisal rope? Thanks so much for sharing!! I’ve been catching up on your blog and wow you’ve been busy!!! Everything is so beautiful, I especially LOVE the garage!!! I LOVED your original idea and I love this one too! I’m totally copying it this year. 😉 And what a great way to display Christmas cards! Thanks for sharing. Love it, it looks great Annie! Great pictures and work ! Love this. Cute idea to replace the bags. I also love your chest and the white dishes. Trader Joes is so good for all these neat cookies. Every time I see your original one posted, I get so excited. Go Annie! You are becoming famous the world over now!! Congrats! Oh man. Now I’m a smitten kitten. I love this one. I want to go out to Home depot and buy a board RIGHT NOW… except I am afraid I will get thumped on a black friday shopping day. LOL. Annie, I have almost finished making my paper bag advent! I thought it would be a great idea to help my four year old wait for presents! Ha! I added a daily advent devotion to each bag too :). Question…where is your table from? Love it! 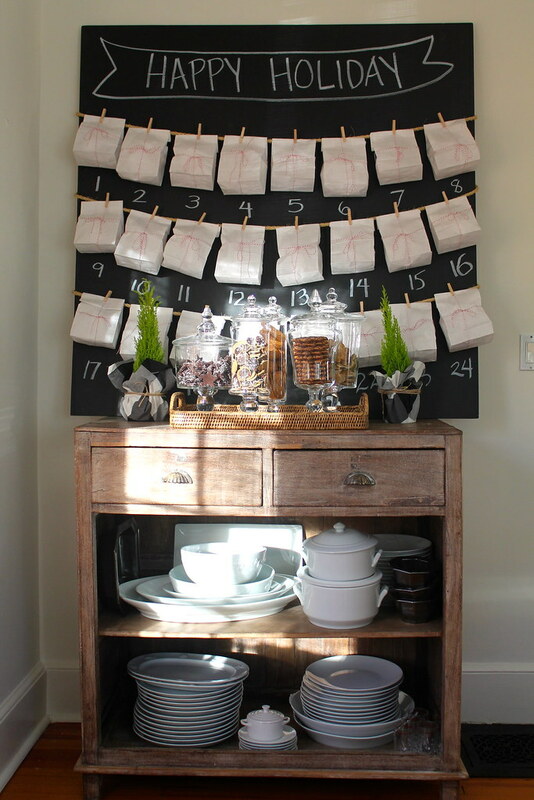 I love this advent calendar…a wonderful way to countdown to Christmas! I remember this one…I sent it to my daughter and daughter-in-law because I thought they would love it! Congrats on selling your idea! You are so clever! I have thought of moving to Word Press…was it painless?